An augmented Adelaide Symphony Orchestra, conducted by John Mauceri, played to a packed Adelaide Entertainment Centre crowd in what was billed an extravaganza festival event. Yes, the voices of the Adelaide Festival Chorus and numerous additional symphony players did create a full, impressive sound but a massive budget doesn’t always produce inspired creativity, and for the first half I found myself disappointingly underwhelmed. Original storyboard sketches and snippets from each film projected above seemed randomly and carelessly selected with little regard for the orchestration, only to abruptly cease and be replaced with swirly patterns displaying for the remainder of each piece. 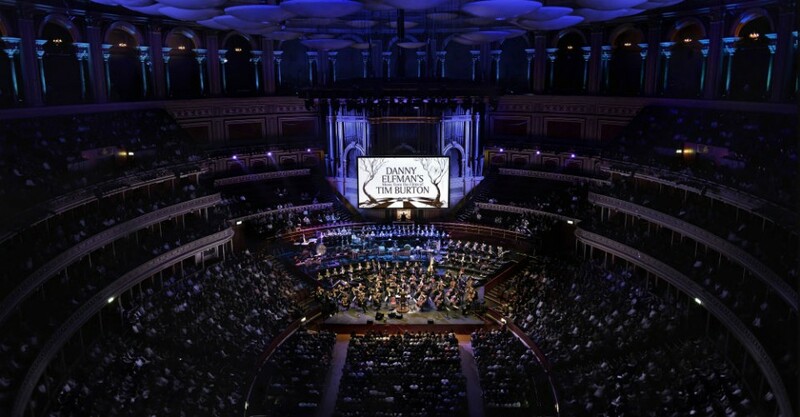 Perhaps my expectations were spoilt with the superb presentation of the Symphony’s recent Pixar In Concert. Fortunately the content and pace of the second half redeemed the failings of the first. The energy shifted with music from Dark Shadows, culminating in a menacing climax as the animated child on the screen drops from a cliff to her death on the rocks below. The intensity shifted again for Edward Scissorhands with an extraordinary violin feature by Sandy Cameron, who powerfully commanded the stage like a predatory rock star. Her skin tight black cat-woman-esque costume surely must have been more than a little distracting for the musicians! Bertie Blackman made a brief appearance for The Nightmare Before Christmas, looking uncertain and nervous, and was an odd inclusion in the program. Special mention must be made of the standout performance by 9-year-old Charlie Wells whose family, seated behind me, were thrilled to bits and über proud of their cousin. Everyone of course was waiting for the appearance of Danny Elfman, and he did not disappoint! Having a ball with character voices and hamming it up with Mauceri, Elfman gave a stellar performance and brought life to animated characters… the quintessential Oogie Boogie Man! Danny Elfman... the quintessential Oogie Boogie Man!